GOLDENROD DOES NOT CAUSE HAY FEVER. The first sight of goldenrod’s yellow blossoms means summer has reached its high tide. Now we’re on the downhill slope to fall. Fall, the time of gorgeous color, and goldenrod is the first bright splash of paint on autumn’s palette. And there’s some mixed metaphors for you. Goldenrod is a native American plant, great for wildlife, beautiful to look at. And yet it’s wildly unpopular. The poor innocent plant has been wrongfully implicated in a crime it did not, and never will, commit. GOLDENROD DOES NOT CAUSE HAY FEVER. This fact cannot be repeated often enough. Goldenrod pollen is not carried on the wind. Goldenrod flowers are bright yellow in order to attract bees and other insects, which pick up the pollen and carry it from plant to plant. Goldenrod pollen does not blow long distances on the breeze, it’s too heavy. Therefore GOLDENROD DOES NOT CAUSE HAY FEVER, any more than tulips or daisies or petunias do. Ragweed is the culprit. 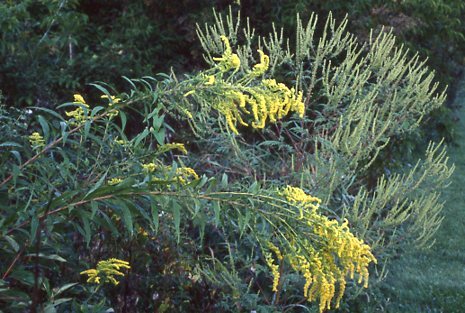 Ragweed, an inconspicuous plant which coincidentally blooms about the same time of year as goldenrod, has greenish, tiny flowers that insects never notice. The plant relies on the wind to carry its billions of pollen grains far and wide. Ragweed causes hay fever. GOLDENROD DOES NOT CAUSE HAY FEVER. Goldenrod to the left, ragweed to the right. Will the real hay fever villain please stand up? Many thanks to Frank Knight for these photos of goldenrod.